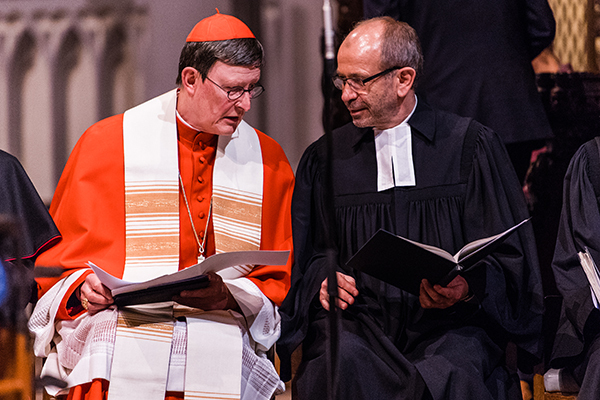 The President of the Rhineland Church Manfred Rekowski and the Archbishop of Cologne Cardinal Rainer Maria Woelki emphasised the unifying bond of baptism. The backdrop could hardly have been more impressive. 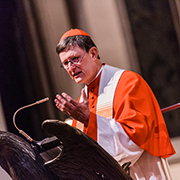 The Evangelical Altenberg Cathedral was filled to capacity as Manfred Rekowski, President of the Evangelical Church in the Rnineland and Cardinal Rainer Maria Woelki, Catholic Archbishop of Cologne, celebrated an ecumenical service of vespers and renewal of baptismal vows on the day of the Reformation anniversary. As the organ opened with “Now thank we all our God”, there were hardly even any standing places left. Baptism, as the sacrament held in common by both confessions, was the focal point of the service with the theme “On the way together as Christians”. The churches are on the way from conflict to community. “We need to search for the treasure that the gospel holds for us,” said Andrea Vogel, Superintendent of the Church District of Cologne and the Rhine Right Bank. 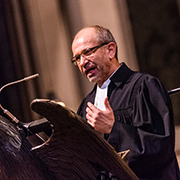 Those attending the service were then given a world premiere performance of the Toccata-Capanella for organ duet by Andreas Willscher with quotations from one of Luther’s hymns and a Gregorian Chorale, followed by an exposition of the passage from the Letter to the Romans by Cardinal Rainer Maria Woelki. Baptism is the occasion on which recognition is given by all the churches that belonging to Christ is broader and greater than belonging to a particular confession. “Wherever people accept this to be true, then unity increases” said the Archbishop of Cologne. Later in the Vesper Service the President and the Archbishop joined in saying an “ecumenical creed”. 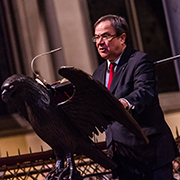 At the entry of Rekowski and Woelki into the cathedral, the ecumenical cross of reconciliation from Cologne had been carried in front of them. Protestant and Catholic representative holding candles read out texts on the theme of ecumenism. This was followed by highlighting the similarity of work done by the Diaconia and Caritas, but also expressing sorrow at the division between the churches, and a will to overcome this separation. One of the candles remains in Altenberg Cathedral, the other candles will be presented to suitable locations by the Archbishop and by the Church District of Cologne and the Rhine Right Bank. “This will serve to extend the idea of ecumenism” said Revd Claudia Posche, who is minister at the Cathedral, a ‘simultaneum’ church which is used jointly for worship by both Catholics and Protestants. The Archbishop had saved up a big surprise until right at the end. He presented President Rekowski with an artwork. “I actually wanted to bring Frankincense and Myrrh, since I don’t have any gold. But then I thought about it in a different way.” The picture showed Martin Luther created out of scraps of paper from the New York Times. 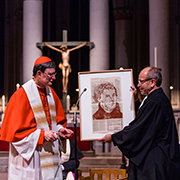 “Because the effects of Luther’s actions spread worldwide” said Woelki. President Rekowski promised to hang the picture in a prominent position in the Regional Church Office. It would be visible at all times as a symbol of ecumenism.